LASERs are highly regulated devices. This post is about the NY State Laser Use Regulations. I am not a lawyer and any mention of laws or regulations mentioned herein should be considered guiding advice for compliance but not considered as legally accurate. The State agency, in New York, which has separate LASER regulations is the New York State Department of Labor - specifically the Division of Safety and Health, Laser Unit. This department within the agency issues a license for a LASERs classified as Mobile Lasers. What is a Mobile Laser? If you have a laser cutter in a facility, or are operating physics tests within a space, these lasers do not require a Certification. The moment any laser of any wattage (with some exceptions outlined below) becomes "Mobile" - leaves a closed and protected space where the public is not trained, or instructed, and the laser is within that sphere of use, NYS requires a mobile laser licensed operator. Mobile Laser: a Laser which operates outside of a laser installation. Laser Installation: Any location where, for a period of more than 30 days, one or more lasers are used or operated. The confines of a laser installation shall be designated by the owner of such an installation. An entire building or other structure, a part thereof or a plant may be designated as a laser installation. For the purposes of this Part (rule), a construction site shall not be considered a laser installation. Basically an uncontrolled area is defined as outside of a laser installation and requires a Mobile Laser Operator. NYSDOL divides the Mobile Laser Operator's License into two types, a Class A and a Class B. There is a test which must be taken in person at the NYSDOL. To operate a Mobile Laser the Lasers are split into "low wattage" and "high wattage" - kind-of. More on that in a moment. The Class A Mobile Laser Operator's License Exam is a relatively simple test filled with questions regarding safe use of lasers, usually catered to usage of lasers within the construction field. The Class B Mobile Laser Operator's License Exam is the Class A Mobile Laser Operator's Exam and a much more extensive test including lots of math. To sit for the Mobile Laser Class A or B License Exam with the NYSDOL, one must have either 1 year of experience working with Mobile Lasers or must have successfully participated in a certified course. The certified courses list can be found on the last page of THIS PDF. MPE is defined as Maximum Permissible Exposure. NYS Code Rule 50. There are 3 tables which define the parameters for MPE within Code Rule 50. These charts may seem a bit like a foreign language unless you are well versed in measuring wattage/joules/nanometers etc. So let us go into some basic Laser terms / functions / measurements. LASER is an acronym which stands for Light Amplification by Stimulated Emission of Radiation. LASERs are measured in wavelength, and their wavelength correlates to their color. For instance, A HeNe Laser is about 600nm (red in color), whereas a green laser pointer is ideally 532nm. A C02 laser (typically found in laser cutters) is in the infrared and is 10,600 nm. Light travels through the eye via specific components of the eye. Infrared wavelengths (1400 or above) are absorbed on the cornea. The cornea has no red blood cells and therefore cannot heal itself. 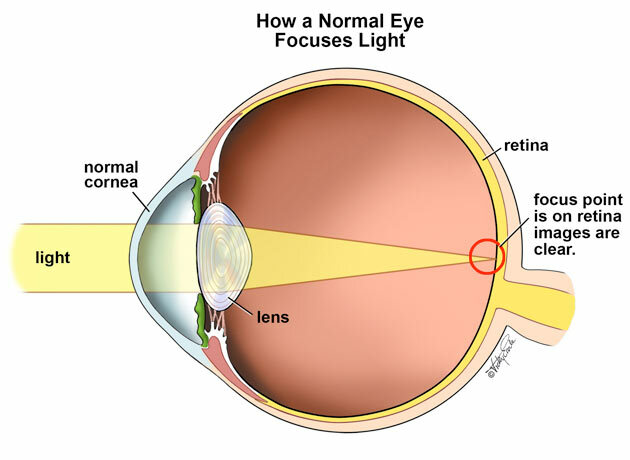 The Retina absorbs 400-1400 nanometer wavelength light (which includes the visible spectrum). For wavelengths which fall below 400nm, the NYSDOL have not resolved what damages may occur under any exposure amount, and therefore cap the wavelength parameters at 400nm ++. Because of the biological mechanisms - Code Rule 50 indicates different exposure limits for the eye in Table 1. Continuous Wave: a laser that emits a continuous laser beam with a controlled heat output, as beam duration and intensity. Watts/Joules refer to the optical power output of a laser beam. Meaning: What is the energy/power of the light being emitted. Continuous wave lasers are measured in watts and pulsed lasers are measured in joules, commonly (pulsed lasers go on and off at a specific frequency, and thus must incorporate time in energy calculations). However, mathematically we could measure watts as joules and vise versa. A watt is a measurement of power and time. (One watt is defined as the energy consumption rate of one joule per second. 1W = 1J / 1s). A Watt Second is the Watt equivalent of a joule. As the above definitions of permissible energy/power contend with centimeters squared. Because lasers emit energy in the form of radiation which can be absorbed in the eye, the laser beam has an area (beam size) to consider when calculating the permissible exposure. In table one, the MPE for the eye is calculating the exposure based on a beam diameter of centimeters squared. Lasers emit light radiation in collimated form. This means that these waves are parallel and have a small divergence. The arrows on the left show light which is not collimated. Those on the right are. If considering the area which the photons (arrows) would land should the grey bar be farther away, the arrows on the right would, in a perfect environment, be the same size as it is now. This is divergence, the consideration of the trajectory. In the real world, however, the laser beam does experience some divergence: the grey square does get larger, as the world and the manufacturing process are both imperfect. Approved Lasers provide the divergence of the beam in their spec sheets. According to Code Rule 50 - Divergence MUST be clearly labeled on any Mobile Laser. There are optics one can use which can keep the beam from diverging, or can decrease the size of the laser beam's spot size. When considering bio effects upon the eye, we must also consider the diameter of allowable light into the eye. The pupil has an aperture. According to Code Rule 50, the diameter of the eye is approximately 7mm. Irradiance is the value of power/energy density and the calculating the MPE finds the irradiance at any given distance. LASER SAFETY OFFICER - The LSO must be qualified in both occupational and public health aspects of lasers. Evaluate potential and real-time radiation hazards of a laser installation/mobile laser. * If you are operating a Laser within a Laser Installation. * Lasers which qualify as Low Intensity Lasers (Class I, Class IIa, Class II, Class IIIa federal classifications) are considered exempt. pursuant to 21 Code of Federal Regulations part 1010, section 1010.2 - i.e.